When should I visit the Amalfi Coast? Writing about places we hold dear is never easy. I have left a piece of my heart to the Amalfi Coast so you’ll surely understand why I found it very hard to finish this article! Packing light for the Amalfi Coast is mandatory. Read our guide to see what do Italians wear in summer and learn about the “Positano Style“! Paradoxically I discovered the Amalfi Coast thanks to my husband, Aldo. Always passionate about this stretch of coastline, he has been riding it up and down since… well. Forever. Seventeen years ago he brought me there for the first time, and it was love at first sight. I could tell you a lot, from the time we spent more than five hours at Sal de Riso in Minori, stuffing our cheeks with cakes to console our best friend after a bad break up (the “sacrifices” we make for our friends! ), to the romantic candlelight dinner on the beach, to that time (please, don’t rent any vehicle you can’t drive!) when a British tourist riding a Vespa almost run us over at Vietri sul Mare. Yet I’ve tried very hard not to write an overly nostalgic post, but I still hope to be able to transmit some of the love I feel for this stretch of coast that I now feel like my home, as we spend almost every summer weekend (and not only Summer) riding there on our MotoGuzzi Griso for our special Amalfi Coast road trip. If you’re planning to visit Italy, you should definitely consider adding the Amalfi Coast to your itinerary. And if you don’t feel like planning everything on your own, pic one of my favorite Amalfi Coast tours: they’re by far the best ones! The Amalfi Coast is considered a World Heritage Site by UNESCO since 1997 and it’s located to the South of the Sorrento Peninsula. It goes from Positano to Vietri sul Mare. You will be able to start your Amalfi Coast Road trip on the SS163. If you intend to use public transport and arrive from Naples, to reach Positano you will need to take a train, Circumvesuviana, to Sorrento. 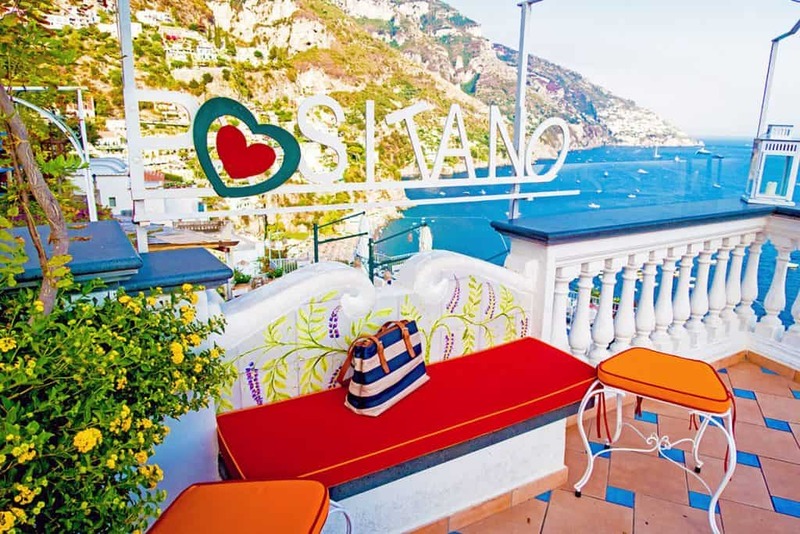 From there, SITA buses will take you to Positano and the other towns, up to Vietri sul Mare. The ticket you have to purchase is the TIC NA-6 (Campania Integrated Ticket) which is valid for 190 minutes from the first validation and costs €5. If you are using the public transport, make sure to visit also the Art Stations in Naples: free contemporary art museums in the metro stations (you can also use them to explore all the amazing things to see in Naples)! Alternatively you could book a private transfer, but costs will rise a lot. If you know how to drive a scooter and you have decided to find a hotel on the Amalfi Coast, you can rent one so you’ll be free to explore without being worried about finding a parking or a bus stop! The most important thing is not to let the internet trolls scare you away from visiting Naples. The city is safe and it’s a good starting point to explore the Amalfi Coast. 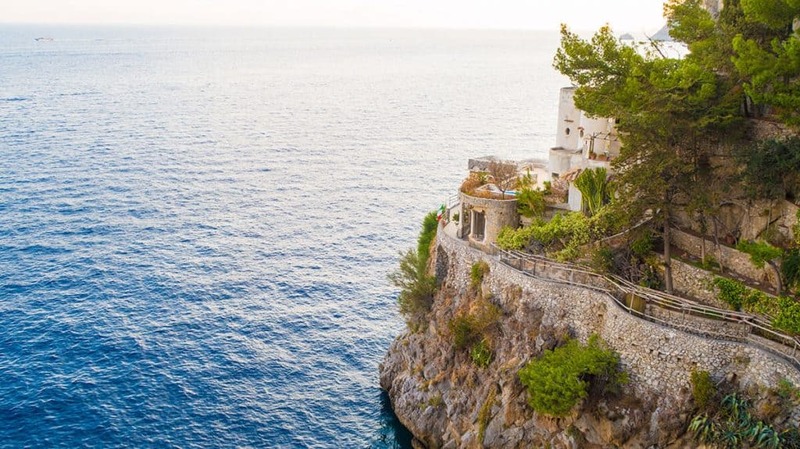 The Amalfi Coast is also the perfect place for couples. Check out my article on the most romantic getaways in Italy to find out the best couple activities on this coast (it includes tips on where to propose!) 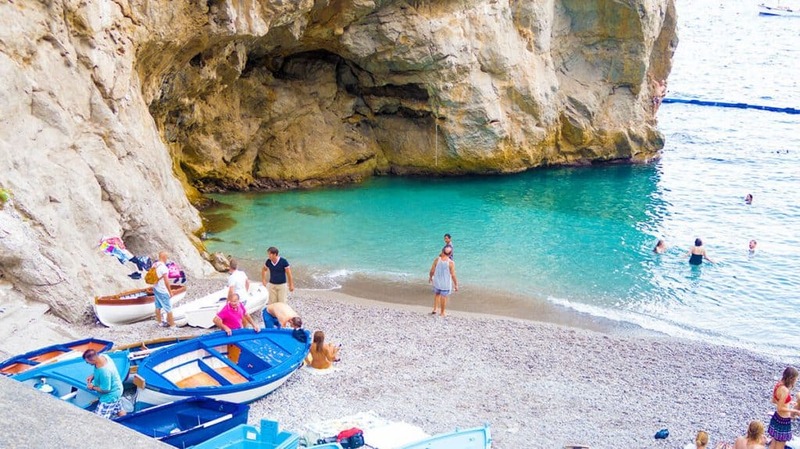 I can also suggest you all the best beaches on the Amalfi Coast, mostly known only to us locals! The SS163 is also accessible by car, but it’s always very busy (consider this also if you get there by bus). Locals prefer to enjoy the Amalfi Coast road trip using scooters or motorcycles. Being particularly full of curves and panoramic views (just like the “scary” road to go hiking on Mount Vesuvius), we can appreciate the best of this road on two wheels. But be careful, especially if you do not know the way. The SS163 is in fact very tight. There are only two ways and so many curves. When buses have to turn, they often occupy almost the whole opposite roadway. That’s why it is important not to speed. There have been a number of accidents, and especially if you are traveling on a motorcycle or in a scooter, you might hurt yourself pretty bad. 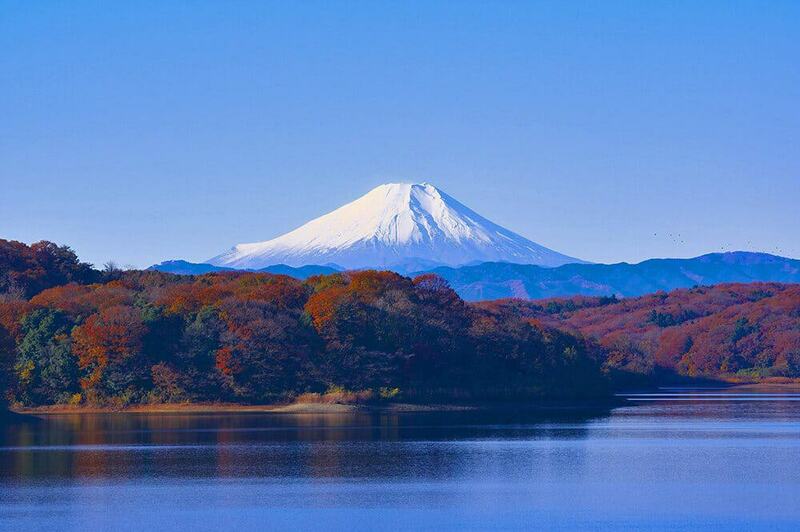 And then … if you speed, you won’t even get to enjoy the magnificent scenery! 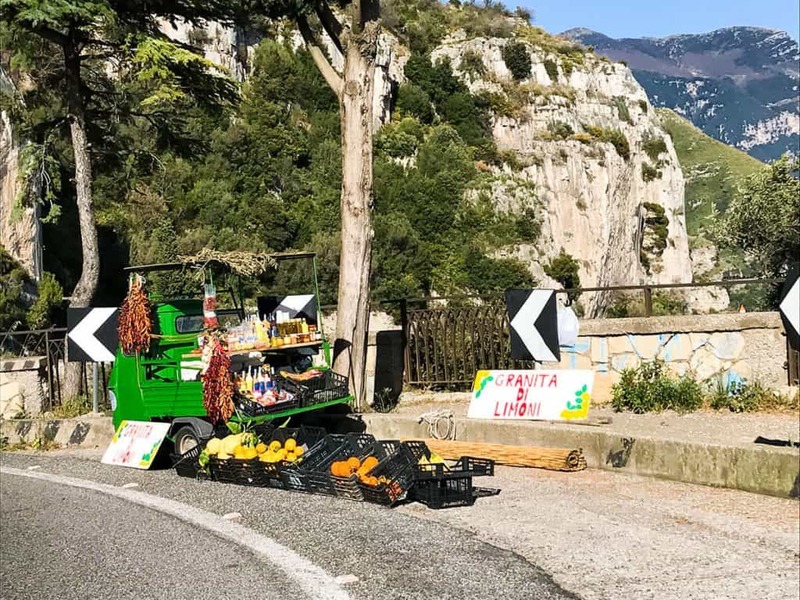 While on the Amalfi Coast road trip you will find some scenic spots with viewpoints large enough to make room for one or two cars (or the granite food trucks you see in the picture). If you use public transport you won’t be able to stop for the view: do not try to get to the viewpoints walking on the road! The sidewalks, where there even are some, are really extremely small and it’s dangerous to stroll down the road! I always recommend scheduling at least one full day to the Amalfi Coast. If you arrive in the morning, you can stay longer on the coastal road, stop for lunch and why not, even for dinner, before to leave. If you booked a hotel in Naples then you could include a day on the Amalfi Coast and one in Pompeii on your itinerary. While you’re in Naples, don’t forget also a visit to Via San Gregorio Armeno, in the historical city center. It’s a small, traditional “Christmas village” open year round! An Amalfi Coast road trip means being sandwiched between an immense rocky wall and cliffs overlooking a wonderful crystal-clear sea. Take a look (unless you’re driving, doh! ): you will feel infinitely small, overlooked by the imposing mountains, from time to time decorated by small houses that seem embedded in the rock. 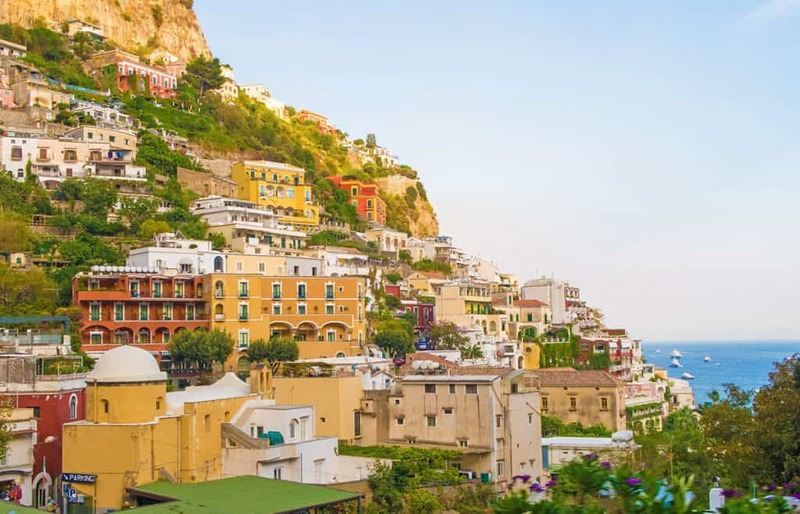 The first town you will find on your Amalfi Coast road trip is Positano, maybe one of the most photographed towns on the Amalfi Coast together with the Furore Fjord, but we’ll get there later on. 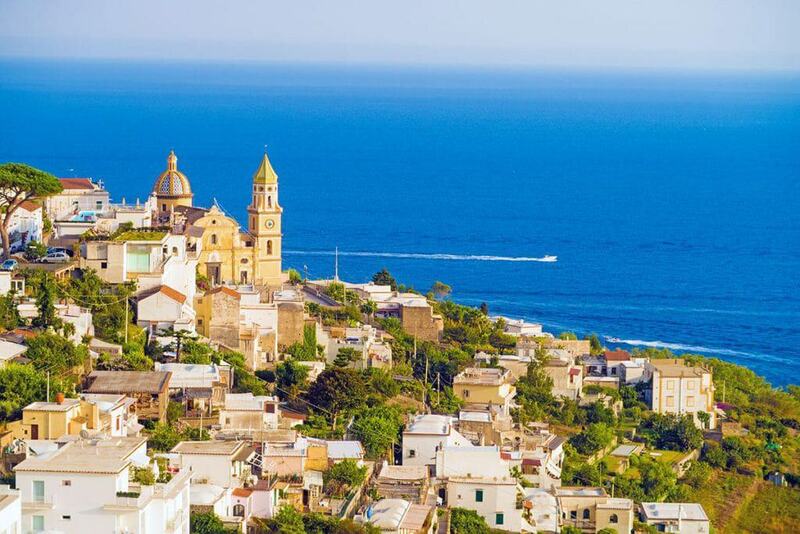 The scenic colored houses that fill all the side of the hill, down to the sea, blend with the green of the Monti Lattari and the blue of the sea: it seems like a painter’s palette. If you are spending your vacation here, consider hopping on a ferry to visit Capri: there are special ferries in summer that will bring you to the most beautiful island in Italy! In Positano you can’t drive your car (or anything else) for the most part. If you arrive by car or motorbike it would be better to park in one of the private car parks at the entrance of the city, since the few parking spaces available (on the only 1-2 roads where you can drive) are rightly reserved for residents. I recommend wearing comfortable shoes because the streets of Positano are narrow and steep: you won’t have to wear high heels, as you will see once there. In fact, this is a small, wonderful, informal and colorful town where, especially in the Summer, you walk around in flats and cute dresses, to explore the narrow streets, to do some window shopping, enjoy a Neapolitan espresso (making sure you apply the guidelines for tipping in Italy), or dine in one of the seaside restaurants, like the ones you’ve probably already seen on our video on the Amalfi Coast road trip that we posted on our YouTube Channel. If you’re going to visit in the lesser crowded months you can also order a pair of handmade sandals in Positano as a souvenir from your trip! One of our Yoshi Bags in Positano! The main beach of Positano is Marina Grande, in front of the Li Galli islands. Here you will also find a few restaurants and a nightclub. Marina Grande is also the favorite venue of so many VIPs, but it can be quite chaotic in the busiest months. If you’re looking for a quiet place, Fornillo beach could do it for you. The other two beaches accessible by an infinite number of steps (about three hundred each!) are Arienzo and Laurito. You will have a great perspective to take take great photographs, but getting there, and especially going back to the main road, can be really hard, make sure you won’t overdo it! 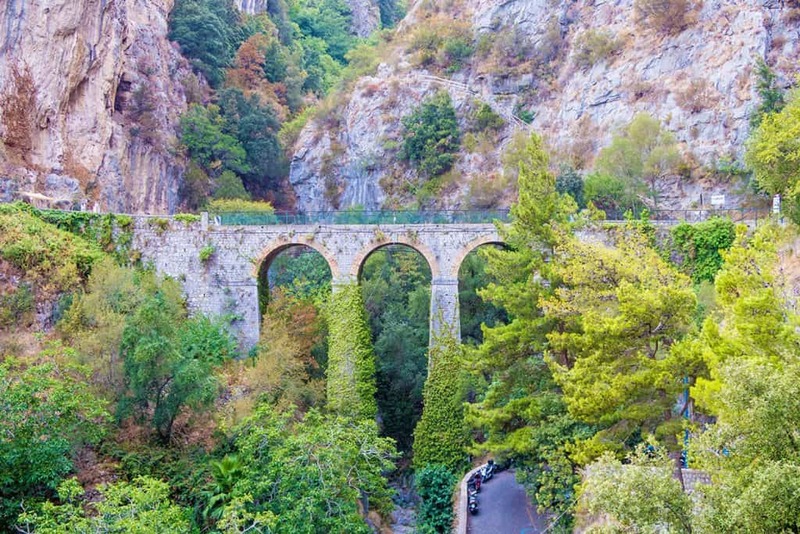 Get back on your bike to advance on your Amalfi Coast road trip: after another beautiful piece of winding and scenic road , you will arrive in Praiano. The postcard view here is characterized by the Church of San Giovanni Battista, famous for the wonderful tiled floor of Neapolitan maiolica, dating back to the 18th century (the Church, however, was built around the 11th century). The nearest beach is Marina di Praia, located at the base of a cliff that seems to want to swallow tourists. From Marina di Praia you will clearly see one of the Saracen towers (Torre a mare, to be more specific) which were formerly used to guard the coast. It’s a tiny cobblestone beach, from which you can reach a restaurant (of course!) famous for fish dishes and the Africana Club, the most popular disco on the Amalfi Coast. There is also a tiny bar run by a very nice elderly person if you want a fresh drink or a coffee to survive the Summer heat. Beware: prices here are higher than average! Immediately after Praiano, along the highway, you will find the only fjord in Italy: Furore. Indicated not only by a road sign, but also by the small crowd of curious and bikers who come here to take pictures, it will be hard not to find it. The deep split in the rocky coast slides inward, creating a nearly dolomitic landscape, that contrasts with the turquoise of the sea. The two valley cliffs are marked by a network of paths, with botanical itineraries that allow you to study the Mediterranean bush. The tiny fishermen’s village was also the set of Roberto Rossellini’s movie “Amore” and is now home to the Costa Diva Museum. If you like movies, I suggest a brief stop here, to learn about all the movies filmed here on the Amalfi Coast. A series of scenographic stairs (also featured in the video at the top of the page) will allow you to reach the tiny beach. In high season it’s always busy and in my opinion loses much of its magic. We like to enjoy it even in the late afternoon when the tourists have already gone and the sun is setting. Returning to the SS163, after a series of spectacular curves near the mountains, along the stretch of road that we usually go through feeling jealous of the lucky owners of the houses overlooking the sea (with pools, too! ), you will cross some small tunnels that go through the rock walls. Typically, tourists who rent sports cars here spend their time with their phones up in the air to film the road, open mouthed. We have been to the Amalfi Coast for seventeen years and we still haven’t gotten used to the amazing views, so … we can’t really blame them! 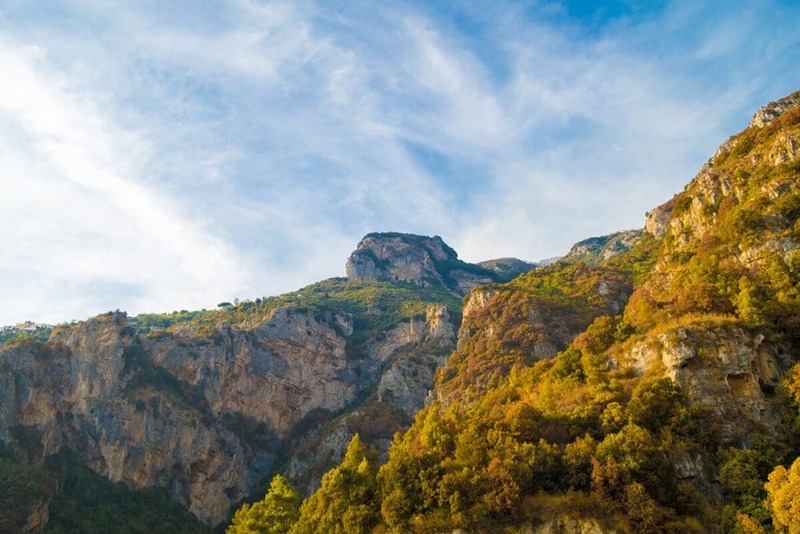 To get to Amalfi you will have to drive for a while: you will find numerous factories and ceramic shops in this section of the Amalfi Coast road trip. After passing through the last tunnel, the panoramic road will cross the port of Amalfi, where there are numerous parking lots for locals and tourists. The city of Amalfi is one of the most renowned tourist centers in Campania, known and appreciated all over the world. To enjoy the visit to this small town of wonders, I suggest exploring the narrow streets and staircases by foot. The Duomo is certainly one of the highlights of Amalfi, with its Arab façade and the large staircase. It dates back to the 9th century and you can visit it for free (cover your shoulders!). If you want to visit the Chiostro del Paradiso or the Cathedral Museum, you will need to pay an entrance fee of 3€. I suggest you take a long walk in the narrow alleys of the old town, and climb up the small steps leading to the highest areas, from where you can take wonderful photographs of the coast. Amalfi is also famous for its delicious Amalfi lemons, which you will find in every garden. From these lemons, we produce (also at home) limoncello, one of the most famous liquors in Italy, and among the other cakes, the yummy delizia al limone. 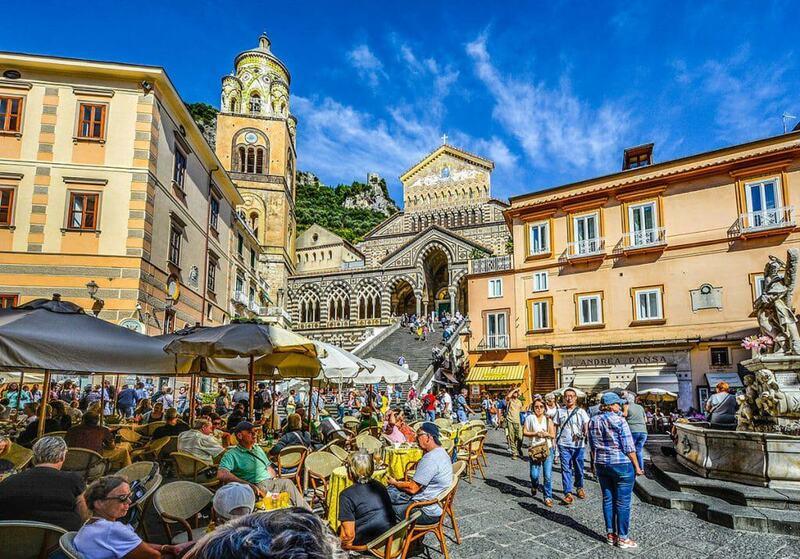 Immediately after Amalfi, on the SS167 panoramic road, you will find Atrani, one of the most beautiful villages in Italy, with just over 800 inhabitants. It is the smallest Italian town, yet there is still room for a cute beach about 130 meters wide! Generally, after passing Atrani, I’m already beginning to salivate. Yeah, because the next town on our Amalfi Coast road trip is Minori, home of the delicious pastry shop by Sal De Riso, easy to find, as it’s just down the road. This is our meeting point with friends, a little corner of paradise where we have been seeking shelter for so many years. The old shop had some wonderful sofas outside, overlooking the sea. You have no idea how much we have laughed there, under the stars! The current one, however, isn’t as cool. The tables are enclosed in a sort of box that in my opinion makes the atmosphere a bit suffocating: it is outdoors, but it seems to be still inside the pastry shop. In Summer it is not exactly the best thing, unfortunately! The inside of the pastry shop is some kind of small museum of edible artwork: large showcases lit by LED lights that make you want to bring home dozens of beautiful pastries. So beautiful that sometimes I’m sorry to even eat them (yes, I was trying to sound like an adult. Actually I can’t stop myself: they’re too good to be true!). Sal De Riso also sells many products that you could bring home as yummy souvenirs from this Amalfi Coast road trip, from lemon rinds covered with chocolate to chocolate cream jars, and even colorful macarons. What you absolutely have to eat here is the delizia al limone by Sal. In other shops it tastes like whipped cream and sugar, but here it smells like the Amalfi lemons. And… the melanzane al cioccolato (eggplants with chocolate). I can almost see your shocked face, and I confess that at the beginning I was skeptical too. I only tasted it when the friend I told you about insisted, during our long session of “let’s forget your ex by binge eating pastries” therapy. The eggplants they use are kind of sweet and seasoned with a delicious creamy and spicy chocolate, nuts, hazelnuts and candied fruit. What can I say … is a caloric bomb, but you can only eat it on the Amalfi Coast, so don’t feel too sorry, you can’t seriously think of dieting here! During Summer time in Minori, as well as in Maiori, the town immediately after on the road, there’s a nice beachfront market. 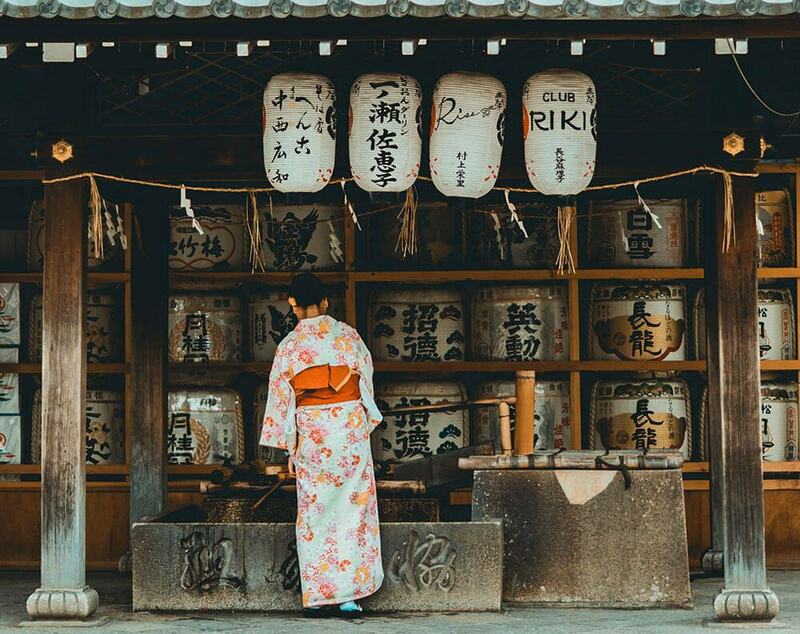 You will find stalls of local products, with shell necklaces and souvenirs, and even food trucks selling fried fish. If you park in Minori, it’s nice to walk to Maiori, through the market stalls. The two towns are in fact located next to each other and I don’t suggest you to pick your car: you’ll risk not to find a parking space in Maiori! 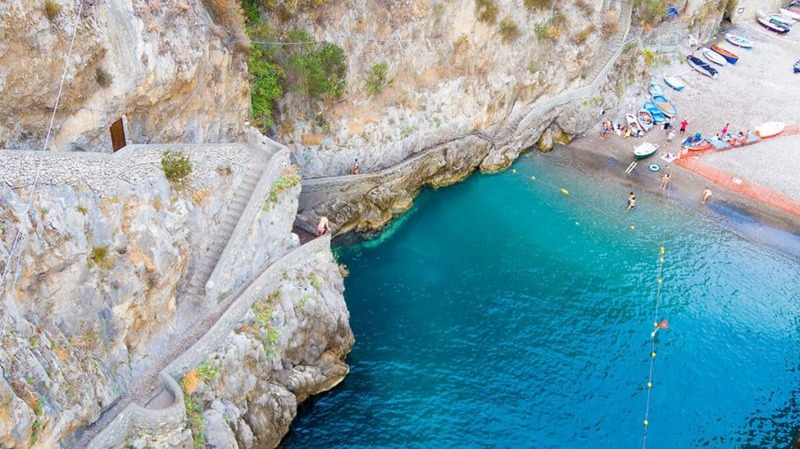 On our Amalfi Coast road trip itinerary Cetara is twenty minutes away from Minori. If you haven’t stayed there for the sunset, then this stretch of road will probably be flooded by the warm rays of the sun setting: the rocks, at this time of the day, become a beautiful orange shade. It’s one of the times when I’d like to be able to take pictures at every turn! Cetara is a picturesque seaside village, located at the foot of Mount Falerio, in a valley lined with vineyards and citrus groves. It is famous for the anchovies (of Cetara, find them here as “alici di Cetara”) and for the Patronal festival of San Pietro on June 29th, accompanied by a marvelous fireworks show on the sea. Every year they have a tuna festival, where you will be able to taste typical local products. We always stop at Cetara for a traditional Italian dinner after a day spent on the Amalfi Coast. Before entering the village there is a guarded car parking for motorcycles and scooters, and a smalle one for cars. The streets inside the town are only accessible by the locals. In the evening it’s nice to walk among the shops, with the scent of the sea in the air, up to the little square next to the beach. Looking at your back you will see the mountain that seems to want to swallow you, with vineyards that go down to the sea. And then the colorful benches of the small playground with the merry laughters of the children. Cetara is the perfect place to buy a nice cuoppo of fried anchovies that you can eat on a bench next to the sea! Vietri sul Mare is the last city on our Amalfi Coast road trip. It is on the opposite side of the Northern entrance of Salerno. La Baia is the first beach you find, coming from Salerno and one of the few sandy coves along the coast. This’s also the perhaps the longer seafront, about 400mt, generally… always crowded. Due to the proximity of the port of Salerno, the waters of Vietri sul Mare are not always crystal clear as in other areas of the Amalfi Coast. 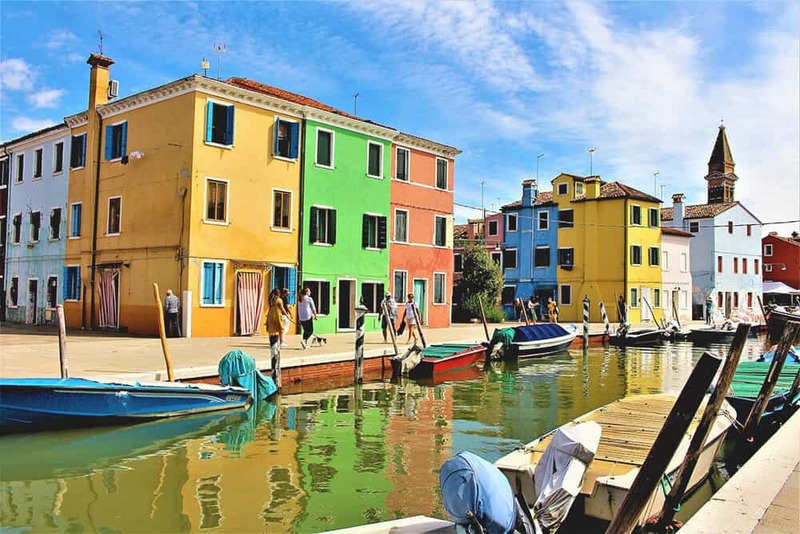 Famous for its colorful ceramics since the Middle Ages, it is full of shops selling dishes, majolica and hand-painted objects in bright and vibrant colors. In the Christmas season, like the neighboring Salerno, they lit up the whole city, especially gardens for the kids, giving them Santa Claus villages, colorful fairies and incredibly beautiful areas where they can play. This is the question that I get asked more often. What is the best time for an Amalfi Coast road trip? Our Winter is (almost) never too cold, but there are abnormal ones: in December 2016 the Vesuvius was full of snow. However, it might rain. March is one of those months where there will probably be no tourists along the Amalfi Coast, but I can’t tell you how the weather will be. I think that the best months, those in which it’s not too hot and there are not too many tourists, are April, May and the first half of June (so basically a late spring trip to Italy! ), September and maybe even October, when, however, you may have to face the rain. Hi Dany! Great and very helpful blog (I’ve got over 10 tabs open with useful information from your blog)! My girlfriend and I will be in Italy next month with our 5 months old daughter. I’ve got a couple of questions I’m hoping you can help with. We’ll start off in Toscana and the plan is to take 1 or 2 days driving from there to Campania, where we’ll spend 5-7 days. Where would you recommend staying en route from Toscana to Campania? We don’t wanna stay in the city, but rather in a smaller city, village or even an “agriturismo” farm. Of course we wanna explore the Amalfi coast as well as seeing Pompeii and Vesuvio and we can’t wait to get a real Nepolitan pizza! Would you recommend staying in one place and doing day trips from there, or staying in new village every one or two nights? Lots of thanks in advance and again thanks for a great blog! I’m SO glad you found my articles useful! I’m always very happy to help people to travel more and enjoy my hometown! On Naples, I’d definitely say that you can stay in Napoli 2-3 days. Plan day trips for Pompeii and Mount Vesuvius, but get back to Napoli to eat/sleep as it’s more convenient. In 1 month you can also visit Christmas Alley, which is amazing, as it’s the perfect period for it (= not too crowded). I’m working on an article on the best places to stay in Napoli, but I can offer you a few suggestions via private mail as well! And on the Amalfi Coast, I’d say you can book in Vietri sul Mare. It’s cheaper, and you won’t have as many problems with parking. Amalfi and Positano are amazing, but parking is impossible or very, very expensive! Let me know if you have more questions, I’ll be glad to help!!! Hi, Dany! Me and my husband will visit Naples and the surrounding attractions in about 2 days 🙂 Just wanted to let you know that your blog posts are extremely useful. I used all your articles on Mount Vesuvius, Amalfi Coast, Pompei and of course Naples city to organize our trip. Thank you for your work and passion! While Luke has always dreamt of visiting Rome, I think my heart has always been on the coast, with those gorgeous, colorful seaside towns. From your writeup, I really can’t pick a favorite or one I’d want to visit more than others – they all look dreamy in their own way. I’ve heard so many stories about the winding roads and what a rush it is making the drive, but it seems like it’s 100% worth it. Wonderful writeup that I’m definitely saving!! 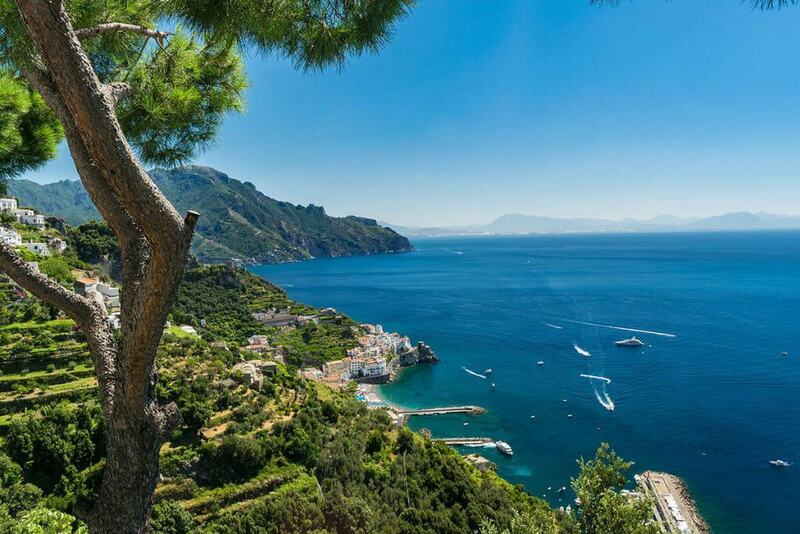 Oh then you’d absolutely love the Amalfi Coast! I think you could plan a week or more to explore all the little towns without having to rush it, 2-3 days in Amalfi, 2-3 days in Positano, and let’s not forget Ravello! It’s not exactly on the coast as it’s up a mountain but still SO beautiful! The Amalfi Coast is so picturesque and magnificent. A road trip there sounds like fun! When’s the best time of the year to go there, Dany? The Amalfi coast is one of the most spectacular parts of Italy. The towns along the coast are real treasures straight out of a fairy tale. We have not been able to travel along the coast as our trips till now have focused more on places like Rome, Venice, Florence, Pisa. Would love to explore the Amalfi coast on our next trip. Fingers crossed that you make it there soon! That’s exactly what we always do! I’m glad you’ve liked it! I’m not sure that I would ever be brave enough to drive the Amalfi Coast. I only visited for a day on a cruise ship. My friends and I had a private tour and that drive was amazing. I was so shocked that volunteers help flag traffic through some of the tunnels to keep accidents from occurring. Beautiful though. Loved it! Dany, Next time I go to the Amalfi coast, I think I would rent a vespa, because the roads are always so packed. I do love it, especially seeing the huge lemons. That’s why we usually go with our MotoGuzzi! There’s just too much traffic! We call the big lemons “cedri” and they are delicious! The Amalfi Coast definitely makes for one of the most beautiful and thrilling drives in the world – we did it a couple of years back, and gotta love those winding hairpin turns! Very good tip on traveling with comfortable shows, because there’s just as much walking involved to explore the towns along the way as there is driving – we loved it – such beautiful views of both the coast and the historic homes on the hillsides. Beautiful photos – you’ve brought my memories back to life! Did you rent a car or a scooter? The hairpin turns are what we love the best when we’re riding our bike, with the sea on one side and the rock wall on the other, it’s just awesome! Danik you rock! I don’t know many people from abroad who feel at ease on driving here and especially on the windy Amalfi Coast, they all feel so scared! How long ago have you visited? This post of yours took me back to Amalfi, where we had spent a few days last October. The weather was perfect, except for a few rains and the views were spectacular. We saw it two ways – by bus and by cruise. Both were amazing. It’s so awesome that you’ve been here Punita! And you chose one of the best months! I’m very glad that the weather was good, this year I suspect will have a nicely warm Winter, as it’s September and it’s still very warm! I’ve never tried the bus but I’ve heard that cruising the Amalfi Coast is awesome? The bike ride look super scary. Haha. But the views are oh so magnificent. Would love to roadtrip this part sometime. 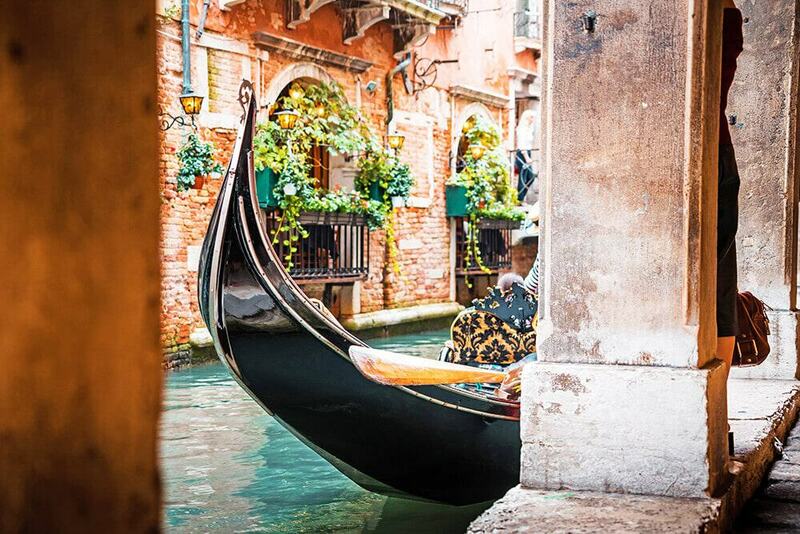 Italy is one my bucket list. Thanks for sharing this post. Loved the video you guys made. Like Paris, Amalfi coast is always a good idea! Especially when Northern Europe is filled with snow and mist! I love the scenery of Amalfi coast and all these ships and gorgeous cliffs! Thanks for sharing! Oh yes our weather is generally better when in other European countries it’s very cold and snowy! Have you ever visited the Amalfi Coast yourself? What a beautiful area. I only reached Surriento, by train, from Napule. I need to plan a trip there, to see all these fantastic landscapes by myself And that fjord, I did not know there were fjords in Italy! Thanks for summing up all this useful information on a beautiful post. The public transport, in my opinion, is not the best way to enjoy the Amalfi coast! Renting a tiny car or a scooter would make it a unique experience! This brings back memories of my trip to Naples and the Amalfi coast 6 years ago. Your photos are much better than mine were! Has it changed a lot from when you’ve been here? I’ve been to Pompeii, Herculaneum and Mount Vesuvius while on a school trip but didn’t have a chance to explore these beautiful places. Would definitely like to return especially after reading this and seeing your amazing photos! I’m sure you wouldn’t be disappointed! You can always get a hotel in Naples and rent a car to visit all the other things! I didn’t know anything about the Amalfi Coast before I read this post, but your photos of the gorgeous scenery here really took my breath away! I love everything you describe here, from the blue water, the colorful houses on the hill, the charming town to the beachfront market stalls <3 This will definitely go on my bucket list! I hope you get to come here soon!!! I think so many of us leave a piece of our hearts here. I spent a week on this coast about 20 years ago and have been thinking to go back ever since, it’s such a beautiful coastline with so many beautiful villages and towns to enjoy. I do feel lucky, and I miss it when I don’t go there as often as I would! Summer is so crowded that July and August are a big no-no for us locals! I’m longing to go back to the Amalfi Coast – I made it there once in my teens with some friends, and they spent most of the time complaining because the beaches weren’t white sand! We didn’t have much money so we stayed in a campsite near Sorrento. The sea was bloody cold but there were fireflies at night. I’ve saved Sal De Riso into my Google Maps, that sounds like my kind of place. Haha that was a clear case of misconception! 😀 We don’t have white sand in the South of Italy! When did you go there that the sea was so cold? It’s September now and it’s still very warm! We love Italy but we still have not got to the Amalfi coast, we were concerned it was going to be really busy. Thanks for the tips about the best time to visit. Try the months I’ve suggested, especially late September (now it’s a bit chilly but the sun still shines) or early Spring! I agree with you that the crowds can be overwhelming, us locals don’t even get close to the Amalfi coast in July and August! 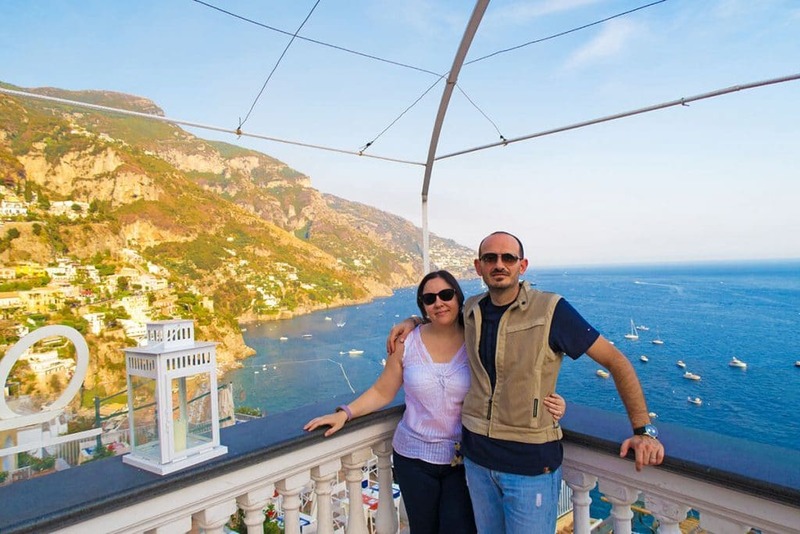 Lovely article, your experience of and love for the Amalfi Coast clearly show. I would love to visit Furore when there are few other tourists around. Then Fall or early Spring might be your best bet! I wish I read this before going to the Amalfi Coast last year!! I only visited Amalfi and Positano. I have to go back! Thanks for this! pinning for my future trips! Scooters or tiny cars (the smaller, the better) are the best way to experience the Amalfi coast. With buses you loose its magic! As for the wind in our air… that’s why we exclusively go to the Amalfi Coast on our Guzzi, we’re addicted to it! I’m dying to go to Italy, especially the Amalfi coast! I was thinking about going this fall, but unfortunately it didn’t work out, someday though! Fall and early Spring are the best seasons to come here, as the crowds are not so overwhelming! Fingers crossed that you make it here soon! Your post brought back amazing memories of this drive I did 2 years ago. The quick halt at Pompei and the endless walks in Sorento! 🙂 Those lime and orange trees! <3 And what gorgeous views! Amalfi is one of my most fav places in Italy! Loved reading this. Thanks! Aw you did this road trip! The perfect choice in my opinion, much easier than using public transport! I never knew that Italy has a Fjord, this is such a cool Information! I also love the stairways that lead to this Fjord 🙂 I’d love to try some Limoncello directly in this Region, it must taste so delicious <3 I love the eggplants with chocolate, I will put them on my Food bucket list! Furore is the only one and the water is awesome! Haha add also delizia al limone to your food bucket list, if you like lemons, then you won’t be disappointed! I want to go to all of these places! Last time I was in Italy we only made it to Sorrento and Isle of Capri which were gorgeous but I would love to see more! Awesome read! Hey Sorrento and Capri are still gorgeous! Maybe next time you could try Naples, Pompeii and rent a tiny car (it’s always better if it’s very small) to try this Amalfi Coast road trip! Great post. Informative, great shots. Well done. Thank you for writing this up. This was my favorite stop on our 2 week trip in Italy. I can’t wait to go back. Definitely saving this for later when we plan another trip to spend some more quality time in the area. I was slightly disappointed with our separate Day trip to Pompeii. I wonder if there’s a better time to go when it’s not quite as amuck with tourists. The food prices in the area were outrageous. I’m so glad you found this useful! As for Pompeii, I think it’s less crowded in early Spring and late fall. You can read my article here as I said, food right outside is VERY expensive and not worth it. Did they bribe you with the “cheap” pizza at 10€? In a normal pizzeria you pay it 4,50€ when it’s expensive and it’s even bigger! I really enjoyed your Amalfi guide, Dany! And those beautiful photos! Seems like summer ended in my country so I am starting to miss Italy badly. I was lucky enough to visit Amalfi coast two years ago and it was so stunning! But we were there in August, so of course, it was very crowded. We are going to Napoli in March so if the weather is good I would love to visit Amalfi off season! Thank you so much Lenka! Last weekend in Naples it was sunny and warm, today it’s rainy but they say that it’ll hiccup for a while so we’re hoping for more sun! As for Amalfi, the worst month is August, both because it can be *very* hot (this year it was a furnace!) and extremely crowded. The beaches are tiny, so there isn’t much space for all the tourists. 🙁 March might be a bit more rainy, but not always, we’ve had very warm Springs lately, so… fingers crossed! Will you have a hotel in Naples? If so, maybe you could try to rent a car for the day (a tiny one will be more than enough and even more comfy, as the road is so narrow! ), in stead than dealing with buses? Gorgeous photos! I’ve never been to this part of Italy but would love to one day. Thank you so much for such a comprehensive post. We were thinking of visiting next spring, I just wonder would 3 full days (4 nights) be enough to see the best? It depends on so many things, like… will you rent a car? If yes, then 3 days will be enough to have lots of fun without stressing too much. If you’re going there by bus, then it might be a bit tight, but it’s just that buses on the Amalfi Coast are a bit messy! And where will you sleep? In Naples or on the Amalfi Coast? 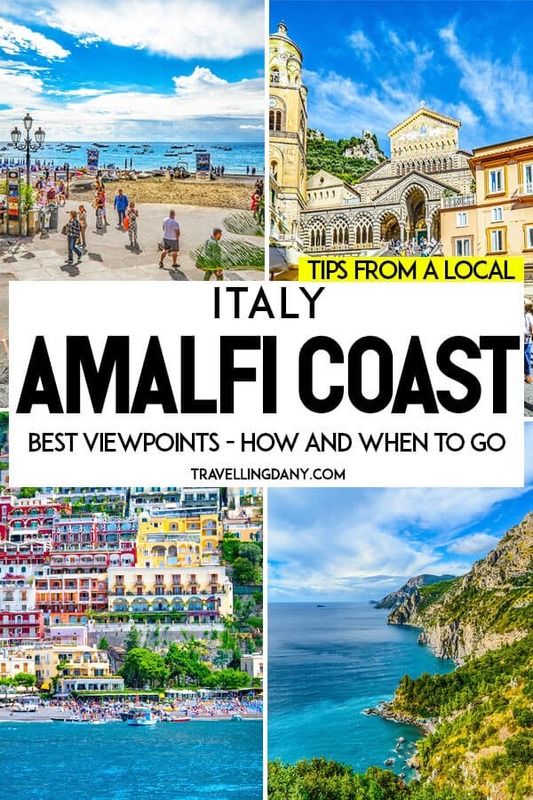 The Amalfi Coast has always been high up on my list but your post was so interesting and informative, I’m going to have to push it up to the top! Love the photos too. Thank you! Fingers crossed that you make it there soon! The trick to save more money is to sleep in Naples and rent a scooter for the Amalfi coast 😉 Positano is so very expensive!